The texture of natural hair often makes using regular shampoos a nightmare especially for African Americans because these shampoos can create painful tangles while stripping hair of natural moisturizers, leaving the hair and scalp itself dry and unmanageable. Finding the best shampoo for natural hair can take some effort and time. However, the shampoos offered in this review, is a great place to start for those still looking for that perfect shampoo. 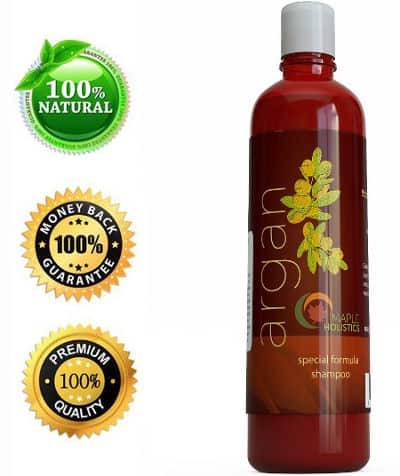 Argan oil is known to do wonders for natural hair and Maple Holistics Argan Oil Shampoo contains 100% pure argan oil. Comes in an 8 ounce bottle. Contains pure argan oil, avocado, jojoba, almond, peach kernel, camelia seed oil and kearatin. 100% safe for colored hair. No artificial fragrance, sulfates, color, additives or impurities. Good for women, men and teens. Water, Sodium Cocoyl Isethionate, Cocamidopropyl Betaine, Sodium Lauroamphoacetate, Sodium Methyl Cocoyl Taurate, Sodium Lauryl Glucoside Carboxylate, Lauryl Glucoside, Sodium Cocoyl Glutamate, Acrylates Copolymer, Coco-Glucoside, Glyceryl Oleate, Argan Oil, Jojoba Oil, Almond Oil, Peach Kernel Oil, Avocado Oil, Camellia Seed Oil, Botanical Keratin, Natural Vanilla and Honey. Clean silky hair: Hair feels clean and silky and is more manageable. Reduces Dandruff: This Argan oil shampoo also helps to reduce both dandruff as well as itching scalp. Soap nuts also known as soapberries are natural plants that clean just like those chemical laden soaps and even better but without the chemicals. 100% botanical and chemical free. Made with organic soap nuts. This shampoo contains no parabens, propylene, butylene, glycols, petroleum, sulfates, alcohol, PEGs, TEA, DEA, NPE, Phthalates, GMO, Silicone, Pesticides, artificial dyes, or fragrances. Reviews for this product are good with most individuals liking this product. Some users state that this shampoo leaves a film on their hair, but most people feel that it leaves their hair cleaner and healthier. Healthier Hair: Not only does it leave your hair shinier and tangle free but it also removes chemical residue from other hair care products, making your hair healthier overall. Stops Itchy Scalp: Users who have had problems with scalp itchiness mention that this itch disappears when using this shampoo. 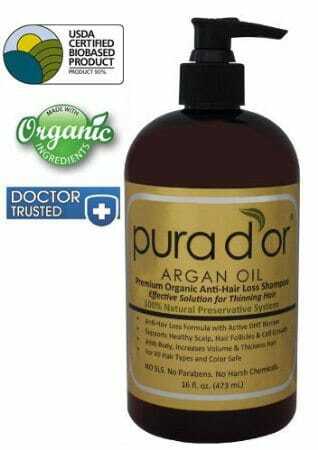 If you are looking for a good shampoo for natural hair that gets your hair and scalp clean while also helping to slow hair loss, then Pura D’or Premium Organic Anti-Hair Loss Shampoo may be worth giving a try. Comes in a handy 16 ounce container. 100% natural preservative anti-hair loss formula. 90% + biobase certified ingredients. No SLS, Parabens, or chemical preservatives. Supports healthy scalp, hair follicle and cell growth. Increases volume and thickens hair. Deionized Water, Decyl Glucoside, Sodium C14-16 Olefin Sufonate, Cocamidopropyl Hydroxysultaine, Cocamidopropyl Betaine, Polyquaternium 71, Cocamide MIPA, Disodium Laureth Sulfosuccinate, Polyquaternium 80, Disodium Lauryl Sulfosuccinate, Tea Tree, Argan oil, Vitamin H, Black seed, Indian Gooseberry, Nettles extract, Saw Palmetto extract, Cedarwood oil, Rosemary oil, Sage oil, Polygonum Multiflorum Root, Lemon oil, Grapefruit seed, Hibiscus Rosa-sinensis Extract, Niacin, Pumpkin seed, Prunus Africana Bark, Zinc Pyrithione, Vitamin E, Soy Isoflavone (Non-GMO), Beta Sitosterol, Green Tea, Lactobacillus Ferment (Natural preservative), Sambucus Nigra Fruit Extract (Natural preservative), Willow Bark Extract and Citric Acid. Reviews for this natural and organic shampoo are exceptionally good with the vast majority of users enjoying the following benefits by using it. Slows Hair Loss: Several people actually noticed less hair loss after only a few uses and many stated that they were experiencing new hair growth. Cleans Hair Well: Users also state that this product cleans their hair exceptionally well leaving it shinning and healthier looking. Thicker Hair: People not only find that this shampoo stops hair loss, but also thickens their existing hair, giving them that fuller head of hair they want and enjoy. Finding the best shampoo for natural hair may require some trial and error, but one of these three shampoos can give you a great place to start. For more options of good quality natural shampoos and conditioners, you can read our best Argan Oil Shampoo and Conditioner article.